Leopardus geoffroyi (Leopardus geoffroyi) occurs throughout most of the southern half of South America. This includes Argentina, Chile, Bolivia, Patagonia, Brazil, Paraguay, and Uraguay. Tge species is widely distributed with the exception of southern Chile, where it is only found east of the Andes. L. geoffroyi has a widely varied habitat, and occurs from sea level through 3,500 m elevations. It primarily lives along rivers in dense, scrubby vegetation. It has also been found in open woodlands and savannas, marshes and even grasslands, although it avoids open areas. These felids are sometimes arboreal, and a high percentage of its feces is found in trees. They are also very good swimmers. 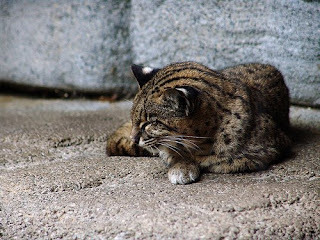 Geoffroy's cat is a small wild cat, about the size of a large domestic cat, with males being larger than females. The head and body length of this cat ranges from 422 to 665 mm, with the tail adding an additional 240 to 365 mm to the total length. It weighs from three to five kg and stands about 30 cm high. Its coat color varies from a silver-grey to a yellowish-brown. The color of the fur varies geographically, with the more yellow forms in the northern part of the species' range, and the more silver colored forms in the south. The fur is marked with a pattern of small, uniformly spaced, dark brown or black spots all over the body. Two black streaks run down each cheek. Melanism is fairly common. The tail is ringed. Females go into estrus about every twenty days, with estrus lasting two to six days. The mating system of this felid is unknown. However, the home ranges of adult males overlap those of several adult females, but do not overlap those of other males (Nowak, 1999; Garman, 1997; IUCN, 1996). This, coupled with the larger size of males, indicates some level of competetion between males for mates, and therefore some level of polygyny. Breeding season for L. geoffroyi occurs from December to May. Females may produce one litter of one to four cubs per year. 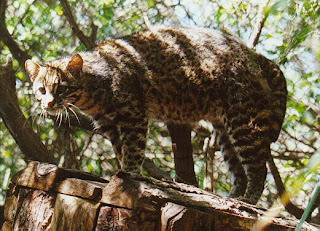 Geoffroy's cat frequently mates in trees. The females have a gestation period of 67-78 days. The female gives birth in a den of bushes, a rock crevice, or sometimes even a nook in a tree (Garman,1997). Young weigh 65-123 g at birth. They are born blind, but their eyes open within 8-12 days. They develop quickly. They can stand at about four days old, and by six weeks are fearless climbers. They can walk after two or three weeks. These cats are weaned at 8 to 10 weeks and become completely independent of the mother after about eight months. Sexual maturity is reached between 14 and 24 months. L. geoffroyi is primarily nocturnal, but has been seen hunting at dawn and dusk. It likes water, and is an avid swimmer. Secretive and solitary, it spends much of its time in the trees. These cats have been known to sleep and mate in the trees. They are quite agile, and have even been known to walk on the underside of a branch. Males and females do not interact much, other than to mate. Females home ranges are about 2.5 square km. Males territories may be as much as three times the size of females. Female ranges may overlap each other, as well as males ranges. Although male ranges may overlap the females ranges, they do not overlap other males. They have a density of about 1.2 individuals per ten square km. Most people are not scared of this small cat, but should be, because it is very aggressive, and has never been truly domesticated. This felid is a hunter, and not a very picky one. It includes a wide variety of animals in its diet, which is dominated by introduced prey, specifically European hares. It will eat just about any kind of meat it can get a hold of; however its most abundant food items are hamsters and hares. P. geoffroyi hunts in trees and on the ground, and is also known to fish (Novaro,1999; IUCN,1996). Foods eaten include: birds, fish, amphibians, reptiles, rodents, wild guinea pigs, small agoutis, hares and other small mammals. 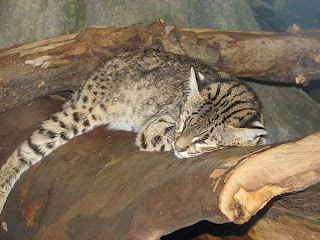 L. geoffroyi is the least protected of all the small cats, having the lowest AZA conservation rank. They are the most common wild cat in South America. However, they are also the most commonly hunted, and population trends are that they are decreasing. IUCN lists the species as Near Threatened, and change the status to Vulnerable if the downward population trend continues. CITES lists the species as Appendix I. In the seventies and eighties, L. geoffroyi was heavily hunted for fur coats, which was legal at the time. It takes approximately 25 cat skins to make one fur coat. 350,000 skins were exported between 1976 and 1979 in Argentina alone, and over 500,000 total from South America in the early eighties. The fur trade has since declined, but about 55,000 pelts are still traded yearly. However, it is believed that most of these pelts are from cats killed that were pests or threats to livestock populations. 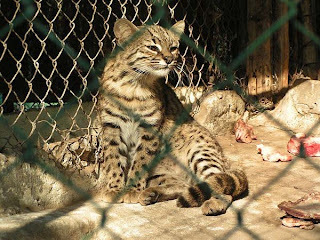 Commercial hunting has essentially ceased, but these cats are still considered endangered. Habitat destruction also affects these cats. Not enough time has passed since the hunting has been stopped to determine their status, but they are now fully protected.